On Friday, March 13, the Armenian Assembly of America’s annual members weekend launched with the presentation of Irene Vosbikian’s book, BEDROS. The novel uncovers the story of Vosbikian’s father-in-law, Bedros Vosbikian, as he travels from the Ottoman Empire to the United States two years before the official outset of the Armenian Genocide in 1915. After marrying her husband, Peter Vosbikian, at a young age Irene spent hours listening to her father-in-law’s recollection of stories about survival, escape, and life as an orphan. Bedros, or the “Armenian Godfather” as the author remembers him, was greatly influential in her life. His stories inspired her to take a deeper look into the atrocities that befell the Armenian people from 1915 to 1923. Her curiosity and sympathy towards the subject resulted in the creation of this haunting story. Bedros, which the author described as “a historical novel, with a lot of truism and not” was updated in content, and was re-released to commemorate the 100th anniversary of the Armenian Genocide. “It’s about survival and going beyond,” Vosbikian told FLArmenians.com. “It’s a story about growing, bravery, and triumph,” she said. It is for this reason that she decided to add new anecdotes from her father-in-law and stories from other Genocide survivors in the second edition. Copies of the novel were available for purchase with all the revenues dedicated to the Armenian Assembly of America. 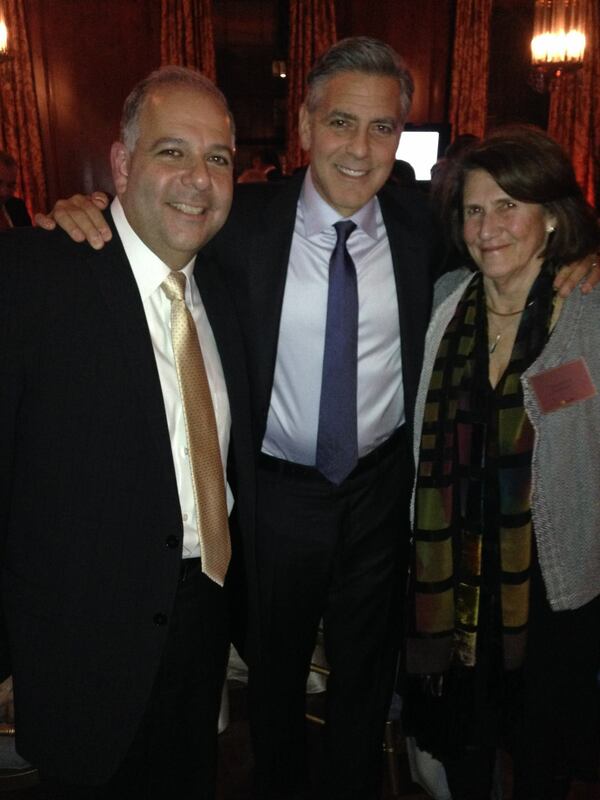 Assembly Board Co-Chair Anthony Barsamian, George Clooney, Assembly Board President Carolyn Mugar at the launch of the 100 Lives Initiative in New York City. Socializing over hors d’oeuvres and refreshments, guests also heard from Assembly Board of Trustees Co-Chair Anthony Barsamian, who discussed the 100 Lives Project, a new initiative by Vartan Gregorian, Ruben Vardanyan and Noubar Afeyan to honor the victims of the Armenian Genocide. As stated in the organization’s website, 100 Lives has two goals: to thank those who helped Armenians 100 years ago, as well as continue the legacy and the remembrance of the genocide through the collection of stories. 100 Lives was founded in cooperation with Academy Award Winner, George Clooney’s organization, Not On Our Watch. On the eve of the 100th anniversary of the Armenian Genocide, Armenians around the world are taking bold steps to remember and demand the recognition of a genocide that re-shaped the lives of an entire nation. Posted on April 7, 2015, in General Update and tagged 100 Lives Initiative, Armenian, Armenian Assembly of America, Armenian Genocide, Bedros, Boca Raton, Florida, George Clooney, Irene Vosbikian. Bookmark the permalink. Leave a comment.